Undeniably stunning, Switzerland has blessed the world with wonderful chocolate, well made watches and a flawless banking system (not to mention delicious nutty cheese). With that in mind, it’s crowning feature is quite simply its efficient and well connected transport system, perhaps the best in the world. Religiously on time, rail travel in Switzerland is effortless, routes across the country take in stunning lakes, jagged mountains and charming alpine villages. A lucky few staff members at Classic have just returned from their staff trip to Switzerland, overflowing with stories and glowing about their adventures. We’ve formulated a guide to Switzerland based on their exciting itinerary. We’ve highlighted what sights to expect on popular rail journeys and some of the best places to visit in Switzerland. So well connected is Switzerland’s transport system, travelling from top to toe of the country is effortless. The handy Swiss rail passes (available for 3, 4, 8 or 15 days) allow unlimited railway and bus travel. Not only that, pass holders get free entry to museums, exhibitions and discounts on mountain cable cars. For that unforgettable luxury holiday, watch the scenery go by in the comfort of first class. The city of Zurich is well connected with rail links across the country and flight links around the world. The scenic rail journey to Zermatt and the Valais region takes in lush green valleys, jagged mountain faces and a smattering of alpine scenery. With an easy change in Visp the total journey time took only 3 hours 12 minutes (exactly). 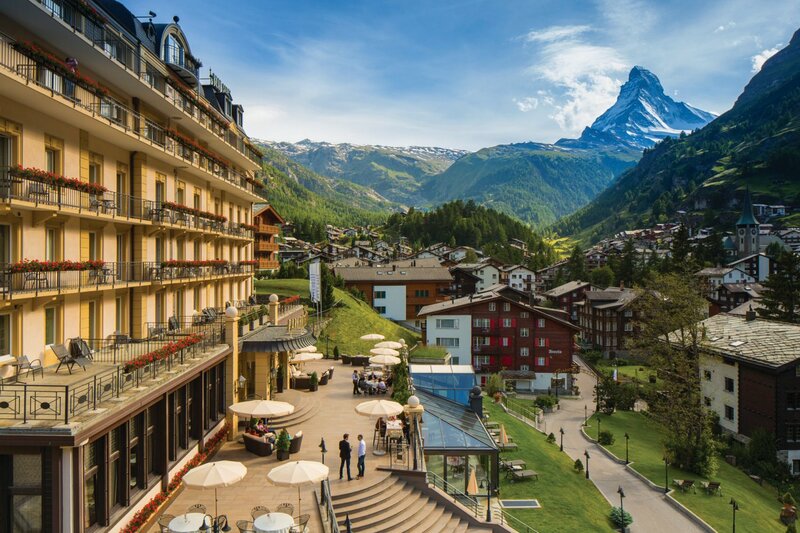 Zermatt in southern Switzerland is renowned for skiing in the winter, but in summer this alpine resort comes alive with colourful blooms and a bustling town feel. Wind around quaint narrow streets and frequent the cosy cafe’s, all whilst the imposing Matterhorn looms in the distance. As a car free village there is a clean, nourishing air. The combination of electric transport and horse drawn carriages gives a delightfully odd mix of old and new. The beautiful journey from Zermatt to the French region of Lake Geneva takes in the Rhone Valley and the glorious surrounding countryside. With an easy change in Visp the total journey time is around 2.5 hours. 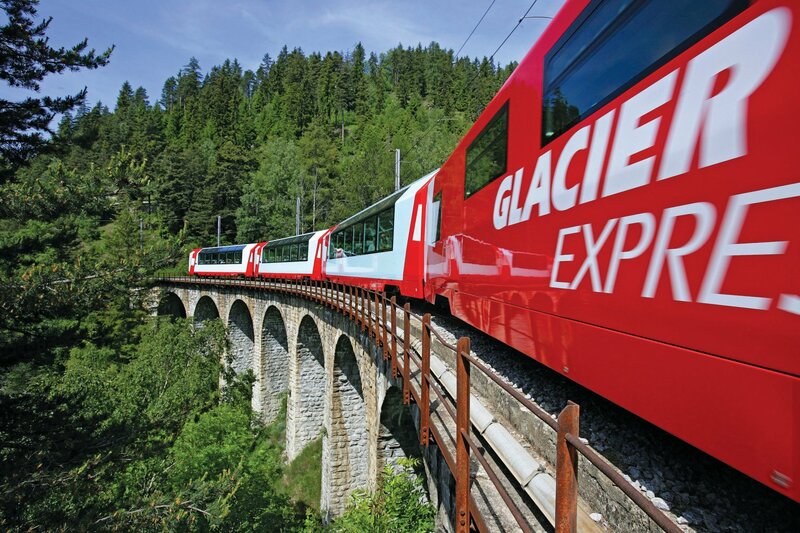 The route shares some scenery with the iconic Golden Pass and Glaciar Express. Drift leisurely past vineyards and the eastern shores of iconic Lake Geneva… beautiful. Visited by many famous names including, Freddie Mercury, Charles Dickens, Charlie Chaplin, Hans Christien Anderson and More. They’ve got to be on to something… see for yourself the stunning region of Montreux in the video below. As hard as it may be to leave the Lake Geneva region a whole bag of treats await in the Bernese Oberland. Arguably one of the most scenic routes in Switzerland the journey from Montreux can be taken by rail in around 2.5 hours. The journey takes in views of the Jungfrau, the banks of Lake Thun and lush alpine pastures. Alternatively the route can be taken on the iconic Golden Pass train which has panoramic views and VIP services. Although the golden pass takes a little longer it takes in more scenery and provides luxury services. Set beneath Mount Eiger and the Jungfrau, the small village of Wengen is only reached by foot or via the historic Wengernalpbahn railway. A popular area for outdoor lovers and avid hikers who flock to take in the Lauterbrunnen valley. Murren most famously featured in a James Bond film, you can now find the Bond world exhibit which is well worth a visit. Irresistibly rural this small village is perched on the edge of a lush green valley. Grindelwald could arguably be the alpine capital of Switzerland. Picturesque chalets, lush meadows and jaw dropping mountainous terrain create a ‘postcard perfect picture’ (try some local cheese making or a visit to a glacier). Nestled between two lakes the town of Interlaken is where you will find the highest railway station in Europe and activities such as white water rafting, zip lining or perusing local boutiques and rustic cafes. Although you may want to stay in Switzerland for longer (as there will always be more things to see) the last leg of the trip, unfortunately has to come eventually. What better way to end than in the town of Lucerne. The rail journey takes just over one hour and cruises alongside imposing mountains and the banks of Lake Lucerne. Unearth the fjord like landscapes of Lake Lucerne. The magnificent lake is surrounded by snow peaked mountains and charming villages. 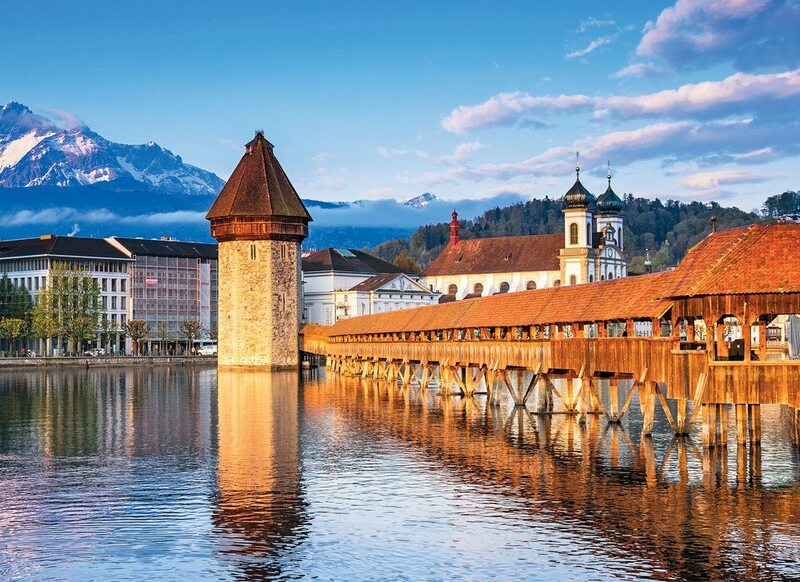 Another traffic free area, Lucerne is decorated with well preserved medieval turrets and rustic frescoed buildings. Easily explored on foot, there are museums, cafes and lake side delights to discover. Jump on a historic paddle wheel steamer from the harbour and set sail for the pretty village of Weggis, or the nearby mountains, all of which have much to offer for avid walkers of all abilities.